Deborah Hutchison: One Gutsy Gal! Deborah Hutchison is one Gutsy Gal. She recently cashed in her savings and produced a short animated film celebrating a gutsy gal from history, Berta Benz. (Does the name Benz ring a bell? Think Mercedes). Deborah aspires to change the way women are portrayed in the media and to encourage girls and women to dream big, be confident, and help change the world. Read on to find out what this AWC member is up to in this month’s Member Spotlight. Lights! Cameras! Action, Indeed! Leslie A. Westbrook: Thanks for agreeing to be profiled in our Members’ Spotlight, Deborah. You are about to launch a new animated film and I am looking forward to knowing when you will be screening it to the public or to our membership. Can you describe your business, Gutsy Gals Inspire Me? Deborah Hutchison: Our business is simply to promote positive female role models. Through animated films, the Gutsy Gals Inspire Me Awards and stories on our website/facebook, Gutsy Gals Inspire Me® aims to inspire girls ages 4 to 104 (and beyond) to aspire to dream big, be confident and help change our world. We need to visually see more female role models in schools and the media, because our girls are the future—whether it’s working with one another or working in conjunction with men. Our goal is to inspire courage, confidence and the desire to drive your destiny. DH: I had very few female role models growing up and decided to make this my mission and company. The stories are taken from historical examples of Gutsy Gals who changed the world and from the enterprising women of the present who are leaving their mark on history as you read this. LAW: What is your typical day like? DH: I get up everyday and joyfully go to work. I am on my journey driving my destiny and hope that I set an example through courage and confidence. LAW: When did you start your business? DH: In 2005, I read a book by a Santa Barbara woman, Mindy Bingham, titled Berta Benz and the Motorwagen. It is the true story of Berta Benz who, in 1888 in partnership with her husband, actually changed the face of transportation. My question was: Why had I never heard of her before? In 2008, I started Gutsy Gals Inspire Me to provide women with positive female role models to look up to. LAW: What made you decide to make an animated short? DH: Why not, was my thought? There are not many animated movies based on real female characters. The artwork from the book inspired me. I thought it was a fresh idea. With talented local animators willing to help, it seemed like the truest method of reaching our target audience. LAW: What do you do differently than anyone else? DH: We are entirely independent. 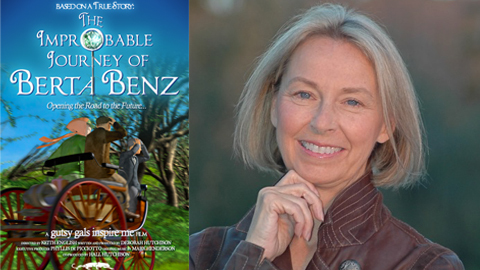 By producing content, such as our animated film, The Improbable Journey of Berta Benz, we aspire to change the way women are portrayed in the media. With no studio support, we have made a beautifully animated short film using a Santa Barbara cast and crew. The Gutsy Gals Inspire Me Awards are open not just to businesswomen, but also to everyday women who have accomplished big things, which may seem small to someone else. LAW: What is your business philosophy? DH: To inspire courage, confidence and the desire to drive your destiny. LAW: Why did you join Association for Women in Communications? DH: I met Lois Phillips some years ago and she presented an idea about establishing a Santa Barbara Chapter of AWC. Who can ever turn Lois down? It was a brilliant suggestion and I was delighted to be part of the founding women for the Santa Barbara Chapter. The idea was to create a place where women in communications of any capacity could meet and share information, look for jobs and meet other women. LAW: How did you finance your animated film? DH: During the 2008 stock market drop I decided to make use of the money I had and bet on our girls. I sold my stock in time and put the money toward the company and the film. LAW: How do you plan on making money or getting your investment back? DH: In my perfect world we find sponsors and/or partners who see the value in our film and teaching guide and purchase it from us for giveaway to schools, museums, libraries and other empowerment building organizations. We’d be happy to give away and match any number of purchases in the same way as Tom’s Shoes. Buy one and we give away one. LAW: How has AWC been helpful or inspiring to you in the past (if it has)? DH: The women are FAB and inspiring to me. LAW: What are your favored communication techniques? Phone, text, email, social media? DH: I’ve been on the East Coast for the past few weeks, so I’ve been using FaceTime to communicate with my interns back in SB. My favorite form of communication these days, however, is definitely social media. The stories we share in our Gutsy Gals blog can be instantly shared via our website and our Facebook and Twitter accounts at the click of a mouse. The interconnectivity of social media websites provides a fantastic means by which we can branch out to new audiences and share our message across a variety of platforms. Email is still great for sending personal messages, but as a small business owner I know all too well how burdensome having to scroll through a mass of emails can be. That’s why I prefer spreading the word about Gutsy Gals events via social media, where people choose to interact with any updates we send out. LAW: How else do you get the word out about your project? Do you use traditional PR? DH: We are now starting to use PR as a compliment to the above. We have released a pitch for the film via pitchengine.com, as well as started groups promoting the film on Facebook and LinkedIn. Plus, we have a Twitter feed that alerts our followers about upcoming Gutsy Gals events and the progress of the film. LAW: What were the unexpected challenges and joys of making your film? DH: One challenge that came was good, and not so good. Just after completing the test animation for the film in 2007, I was delightfully informed that Sterling Publications, a division of Barnes and Noble, had picked up my book proposal for Put it in Writing! Creating Agreements between Family and Friends to be written and in the market place by December 2009. I had to put the film on hold, because in 2008 I was getting paid to create the book. See my website ASaneApproach.com to view the book and it’s contents. I held onto the rights of my agreements, so that took even more time to develop the website. I went back to work on the film in 2010, and now we are finished! The joy is about getting to tell Berta’s story, is working with fellow talented filmmakers from our SB community. Our Executive Producer and amazing mentor Phyllis de Picciotto; Keith English, amazing Director of animation, and wonderful big music from Mark Henderson. Perhaps my biggest thrill is having the vision and staying with it no matter the challenges. I had never ever made an animated film and we did it with a small budget. The joy is presenting inspiration for girls and women. We can do – we will do and we are doing more and more each day. My joy is to be part of the change and inspire girls and women to have courage, be confident and drive their destiny. LAW: How can members and friends of AWC-SB help? Do you have any upcoming events or specials or anything else the chapter members should know about? DH: Help us spread the word about our Indiegogo campaign through October 6. We want to positively impact a future generation of Gutsy Gals and we humbly accept any assistance in financing or promoting the film. We are currently holding a fundraiser on Indiegogo for our film. We hope to raise enough money so we can distribute and exhibit this film to schools and libraries nationwide. The event is currently underway and ends on the night of October 5. Any donation to our campaign is deeply appreciated and is going toward a good cause: our daughters’ futures. We are pleased to announce our first film, The Improbable Journey of Berta Benz has been selected to screen at the LA Femme International Film Festival on Friday, October 12 at 4 pm. LAW: Any regrets? Would you do it again? DH: Not one regret! Absolutely I’d do it again! We hope to make the film part of a series of Gutsy Gals Inspire Me films. We hope to branch out and give more Gutsy Gal Inspire Me Awards. We will have an announcement soon, but can’t make it quite yet! LAW: Thanks for sharing your thoughts with us Deborah, any parting words? DH: We’d be grateful if everyone would follow us Facebook and Twitter, and join our Gutsy Gal Family on the Website Gutsy Gals Inspire Me. This entry was posted in Featured Members and tagged Deborah Hutchinson on September 27, 2012 by Lisa. I really enjoyed reading how Gutsy Gals Inspire Me came about! Such a great idea! I will post to all of my Facebook and other Social Media sites! Great job! Congratulations!